In the wake of the growing need of GRC technology solutions across enterprises globally, CIO Applications has compiled a list of “Top 25 Governance, Risk, and Compliance Technology Providers 2017”. 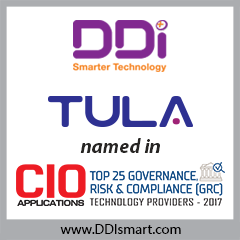 TULA recognized by CIO Applications magazine as "Top 25 Governance, Risk & Compliance (GRC) Technology Providers - 2017". In an attempt to further build on TULA, DDi provides proprietary Artificial Intelligence and Automation platform - YANA. The platform amalgamates robotic process automation, AI, machine learning, and digitization to identify risk and deliver flexible business operations. In addition to TULA, the company also extends products for clinical development such as mEDC, mIRT (RTSM), ClinMet (Analytics), dattasa (Trial Automation) and safeXchange. As the Life Sciences industry is highly regulated and several compliance areas are to be followed at each stage, DDi provides solutions with an amalgamation of functional and domain expertise to cater to their global clients’ needs. The firm brings in a single centralized system that enables organizations to develop a single source of truth to employ systematic enforcement of risk and compliance across enterprises. DDi provides a portfolio of products that enforces regulatory policies and minimizes the risk within the organizations.